ABC is hitting back at Washington Post TV critic Tom Shales for pushing “an utterly fabricated controversy” about “This Week” host Christiane Amanpour supposedly calling on viewers to honor slain Taliban fighters. To review the background here: Amanpour, formerly chief international correspondent at CNN, had her debut on Sunday as the new host of This Week, ABC’s sunday politics show. When her selection was announced in March, Shales wrote a column attacking Amanpour for supposed anti-Israel bias (on the basis of a random Facebook group), pointedly noting her childhood in Iran. Perhaps in keeping with the newly globalized program, the commendable “In Memoriam” segment ended with a tribute not to American men and women who died in combat during the preceding week but rather, said Amanpour in her narration, in remembrance of “all of those who died in war” in that period. Did she mean to suggest that our mourning extend to members of the Taliban? “Christiane took the language from a prayer that she says in her Catholic church every weekend. It’s a bidding prayer,” Schneider said. He accused Shales of “trying to create some kind of controversy out of something that is utterly well intentioned — which is to honor both U.S. soldiers that have died in battle as well as civilians and ordinary people who die in war all the time. Seems like a fairly non-controversial thing to do.” The segment, which you can watch below, features the names of slain U.S. servicemembers on the screen as Amanpour speaks. Shales did not respond to a request for comment about his critiques. 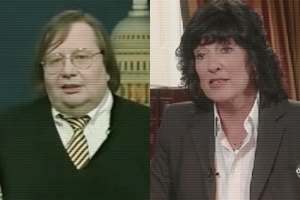 It’s worth noting that Shales also once criticized Amanpour for her hairstyle.